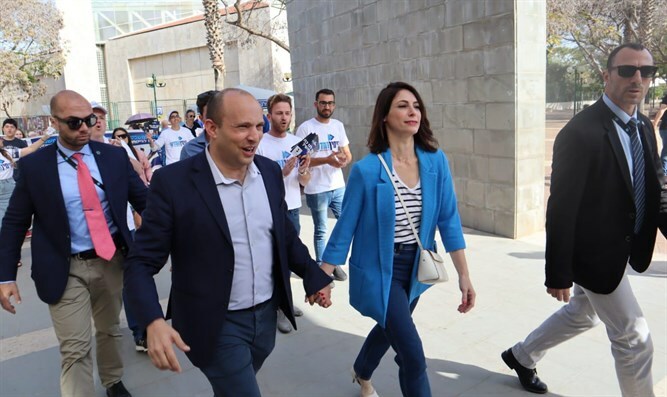 Minister of Education and Chairman of the New Right Naftali Bennett arrived Tuesday morning to vote at Raanana's Arts and Music Center, accompanied by his wife, Gilat. When he arrived at the ballot box, Bennett said, "Today is Election Day. I want to ask everyone to vote for the New Right. We are good people who do good for the people of Israel and believe in the people of Israel. Do not believe the scare campaigns from all directions, everything is fine." "The time has come for one thing. These elections are really only about one thing - will the State of Israel finally back up its IDF soldiers, even when sometimes it hurts? Will Israel start being victorious again? "We will remove the excess legalization and defeat the enemy. We will be strong, we will be united, both religious and secular. We have a wonderful people," Bennett said.